It's been four years since I've relocated to Singapore and I've come to miss my friends back in Malaysia very much. I would often harass convince them to come down for short breaks just so we could meet up. "What holiday? Have you seen the exchange rate lately?! ", they would exclaim. "Well... err, you can stay with me and I'll cook for you. That would be priceless right? ", I'd resort to bribery. Some of them succumbed to my bed and breakfast offers while others would catch me for a quick cup of coffee or lunch when they're here for work. However, lately I realized, to my chagrin, that I can't always be in the country when they come to the island on their own schedule. So I'd bake them something before I leave. Thankfully, up till now, the results of my affection turned out pretty well. The requests were always for something chocolate and I'd know exactly which cake I'd end up making. For the last one though, I was getting rather tired, literally, of making the same best ever chocolate cake over and over again. After a long business trip and only having a couple of days to hang before I had to pack up for Hong Kong again, I wasn't sure if my level of enthusiasm was sufficient to fuss over a layered cake with homemade berry compote filling and frosting of chocolate ganache. The last thing I wanted was to feel like it's a chore in the kitchen, so I had to change my plan. 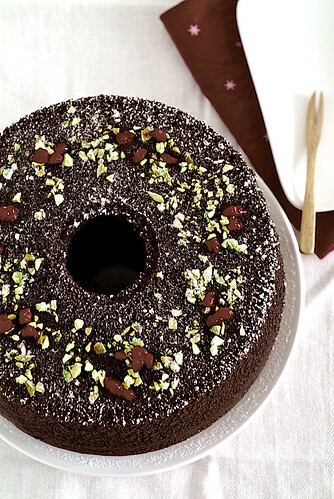 How many types of chocolate cake can we bake before we call it a day? It'll be awhile before I run out of great recipes to try but next in line on the list of awesome-chocolate-cakes-to-bake was one which Vijay declared he would have no issues with. While he wasn't so excited about the last leafy green chiffon, when I came home one day with two pieces of chocolate ones from Bengawan Solo, he gladly finished them in less than two minutes. Great, I thought, this would be a breeze. Except, it didn't turn out to be so easy. For starters, I didn't have a working recipe. Good Shirley, with quite a few chiffon cakes already under her baking belt, without fail helped me out with one version despite her busy days. However, missing from my ever growing stack of bakeware is the required 17-inch tube pan so I decided to go with this rather more substantial 'light sponge' from All Recipes instead. With that sorted out, I quickly proceeded to worry myself silly about getting a respectable height from the cake, as chocolate chiffons are not quite like other chiffons. The cocoa powder's volatile reaction (or non-reaction) with rising agents - depending on whether or not you're going Dutch - bothered me to no end. The recipe doesn't mention if the cocoa powder should be Dutch or natural so I gambled on my favorite Valrhona and hoped for the best. So while I did the dishes after putting the cake into the oven, I was like a woman possessed. Every five to ten minutes I would rinse off my soap laden hands and steal a peep at the oven, praying for the cake to rise properly. For the first 20 minutes when the batter was still setting and didn't move northwards much I thought I was pretty much doomed. I was going back and forth in front of the oven for the entire hour it took for the cake to be done. If the oven could speak it would've disowned me. Thank God the cake did puff very much upwards in the end, although it wasn't as tall as its pandan cousin. To test the doneness of the cake, instead of pressing it for a spring back action, I used the cake tester approach. All went well after it came out of the oven, cooled for a few hours and later removed from the pan - although to be honest I really only relaxed after the cake stayed the way it came out half an hour after it was released. While it was very moist, fluffy and light, it wasn't like eating a piece of cloud so if you'll have to decide if this is the kind of chocolate chiffon you're looking for. As for me, I'll try out Shirley's recipe once I get my hands on a smaller pan. If you're by now slightly worried that Life if Great is turning into a largely chocolate cakes-slash-desserts center, well, I really can't promise anything. Prior to making this cake, I was thinking of chocolate pudding. Immediately after baking this cake I wanted to make a batch of cocoa brownies to bring with me to Hong Kong. As of right now, after an hour-long conference call in my hotel room, I'm thinking of having a piece of that chocolate Swiss roll stashed away in the minibar icebox. So you get the picture - I'm helpless in the power of chocolate but if you're like me, enjoy this cake and the long Labor Day weekend! Note: I mostly followed the recipe except I skipped the (heavy-looking) icing, added some coffee to enhance the chocolate, split the sugar to beat the meringue and folded in the meringue using the traditional chiffon cake method (oh you know, the 1/3 to lighten then fold in the rest thing) but feel free to do as per the original recipe and see how things unfold, hopefully with much less drama in your head. Preheat the oven to 325°F (I set my convection on at 150°C) and place the wire rack at the lowest slot. In a bowl, combine cocoa powder, instant coffee and boiling water until smooth; cool for a minimum of 20 minutes (I left mine for a couple of hours till the mixture thickens at room temperature). In a large mixing bowl, combine flour, half the sugar, baking soda and salt. Add in the oil, egg yolks and vanilla. Mix well and then add the cocoa mixture; whisk until smooth. In another mixing bowl or a stand mixer, beat the egg whites and cream of tartar. Add in the other half of the sugar gradually and beat until stiff peaks form. Fold in 1/3 of the meringue into the egg yolk mixture and mix well. Gently fold in the rest of the meringue without overmixing. Pour batter into an ungreased 10-inch tube pan. Bake for 60-65 minutes or until a cake tester inserted into the middle comes out clean. Invert pan to cool completely before removing it from the pan. Top with icing sugar prior to serving. 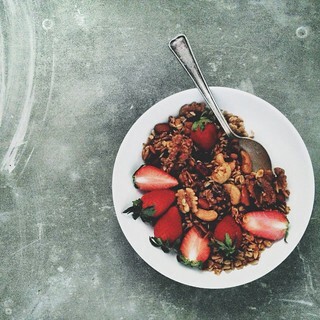 If you're feeling fancy, garnish with some chopped pistachios and fresh raspberries. I love how you decorated this cake! You made the chiffon look so elegant and I love the dark chocolate color. I am drooling .... can I have one piece, like now? kirbie: Thanks. I had a bunch of colorful edible flowers as an alternative but I thought that would've been too much. Mrs. Chan: I can bake for you when I come stay at your new place, provided I get Sendai pot nasi ayam in return. i have been waiting for the recipe since seeing the photos on your flickr. great looking one! How gorgeous the cake looks..rich, exotic and lovely color! Anh: Thanks, it tastes good too. A foolproof recipe I would say. Adrienne: I think you're turning into a baking goddess yourself, so bake for your mama when you come back. I will visit for a piece of cake. 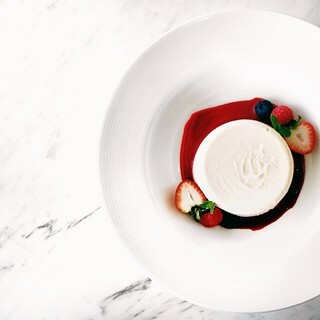 Sanjeeta: All thanks to Valrhona cocoa. I'm addicted to that stuff. 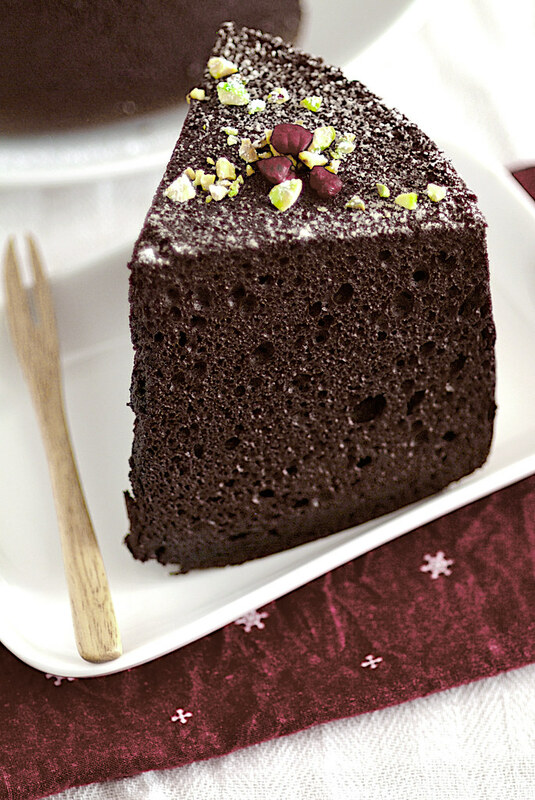 The decorations on your chocolate chiffon reminds me of christmas - along with the red napkin! 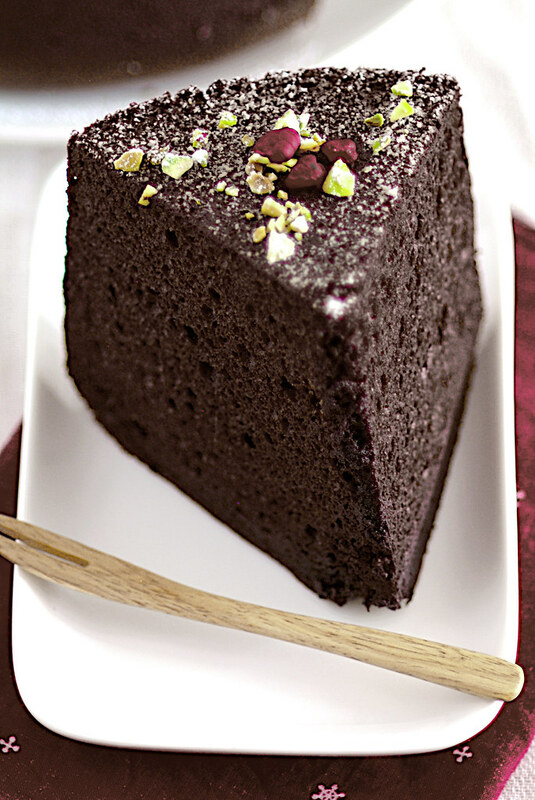 I've been on a chocolate craze too (actually since forever) and I've been trying out all sorts of chocolate cake, not yet a chocolate chiffon though - am bookmarking this to try when I've the craving for chocolate chiffon! I am not a big fan of using leavening agent or stabilizer in my chiffon. However, I can see that this cake is very 'stable' and would be a fail proof option. 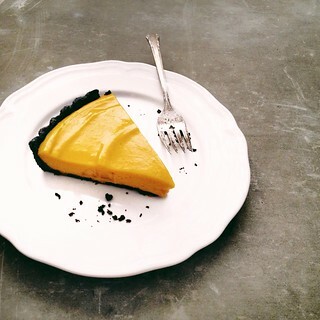 Love your photos and the clean de mould of the cake! Shirley: I'm a wuss at modifying recipes I haven't tried so with this I stuck to it and couldn't afford any disasters as I'm going to be travelling (and I realized later that was the LAST of my cocoa powder!). As for making chiffon without cream of tartar and leavening, I'll try your recipe soon! Janine: Now that you mentioned it, the cake does look very Christmasy! What a gorgeous cake! It really looks so stunningly beautiful and elegant. 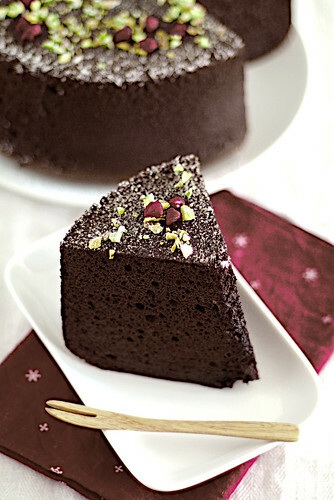 Your chocolate chiffon cake looks absolutely perfect and such beautiful clicks. I must try your recipe soon. delicieux: Thank you, try it! Ellie: Thanks, Shirley's recipe looks more authentic, I will try that and post it up soon. wow! the demolding process is so well-executed, something I would only be able to do, in my wildest dreams probably! Alan: Thanks! Actually demolding for me was quite breezy (but I only made two chiffons so far) as the cakes were moist and their crusts just very thin. Using a very thin knife would do the trick I think. Mei Sze: I've been waiting so long for the same reasons. Try out different recipes and experiment but whatever you do, use good quality cocoa. Not all are created equal. All the best! 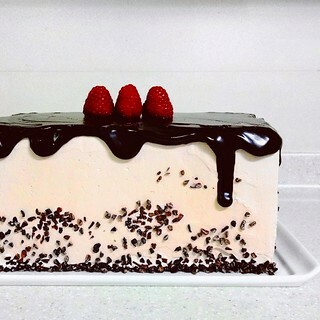 It's truly gorgeous this cake. Makes me wanna dash to the kitchen and whip it up! SO TALL!! 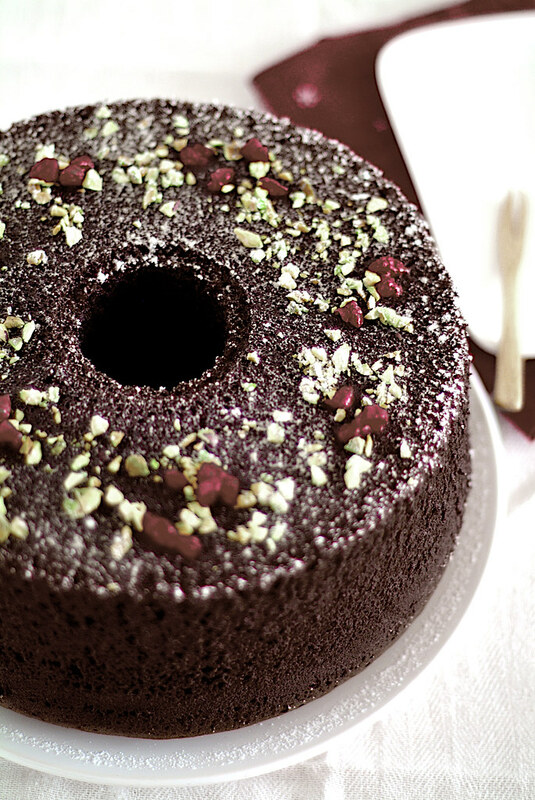 Sherie: It's a very easy cake, go whip it up now and you can eat it for breakfast tomorrow morning! 10 minutes, do you think? am3thystfyr3: I reckon maybe 15, but check quickly at 10 just to be sure. Oh my, this chiffon is so luscious. I am going to bookmarked this. Precious Moments: Thanks, do try it soon. You'll not regret it. I tried your recipe yesterday as it was the top link while i google searched for 'chocolate chiffon cake'. I did little modifications (1. opt out instant coffee, baking soda & vanilla extract 2. using self rising flour, 3. use only 1 cup of sugar) and it turned out very soft, moist and tasty despite I burned the top of the cake a little due to taking care of my baby took me slightly longer time in checking the cake (like about 20mins too late). 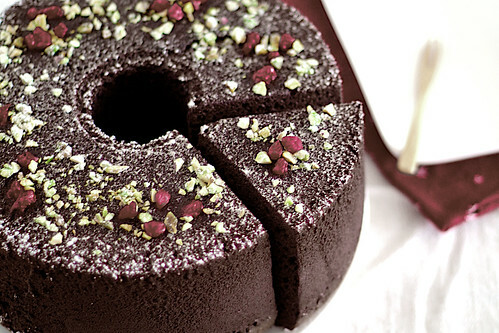 I will definitely bake this again with more modifications like adding some nuts, topping with ganache and so on. Thanks for your recipe, steps and superb photos. (Mine does not look as nice as yours, hoever I couldn't wait to try it before it got cool completely, so I had yummy warm chocolate chiffon freshly taken out from my oven, even my 16 months old baby like it-discourage letting baby eat chocolate food as it keeps them awake, sigh). Oh Mingjer, your comment cracked me up. Your modifications yielding a soft cake is interesting because I've gotten a feedback saying it's not soft enough compared to a typical chiffon (to which I agree). Try feeding your baby good quality dark chocolate, I think it's really the sugar that keeps them awake, not the chocolate. This recipe is great! Thanks for posting.. 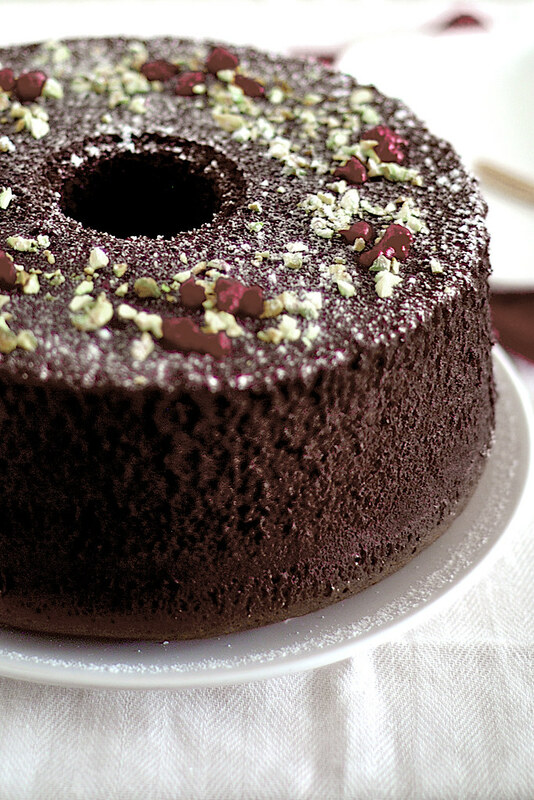 I was looking for a chocolate chiffon cake recipe and that's when I came across your blog.. I tried making it and it was just perfect! Tastes really good! I was just wondering if you could share a buttercream icing recipe?? I tried one but it didn't work for me..
Enavnai13: I'm glad it worked for you, this is quite a foolproof recipe. Chiffon cake purists would say that it's not light and cloudy enough though. For a light buttercream frosting you may try the Swiss Meringue Buttercream. However I think this light cake calls for a lighter frosting such as an Italian meringue or the 7-minute frosting. Experiment! Anon: Fold the meringue with a rubber spatula, keeping your hands light. Start scraping from the sides of the bowl in a circle towards the center. Turn the bowl slightly, repeat. As soon as you don't see anymore white meringue bits, stop mixing and pour the batter for baking. This is very similar to my German great grandma's recipe, except no coffee and instead of baking soda, her recipe called for 3 tsp baking powder. And she used regular flour. I've tried this recipe yesterday ans it was perfect. Just needed longer cooking time, maybe because it was a different oven! Thank you very much for this recipe! Will this recipe fit in an 8" x 3" pan?